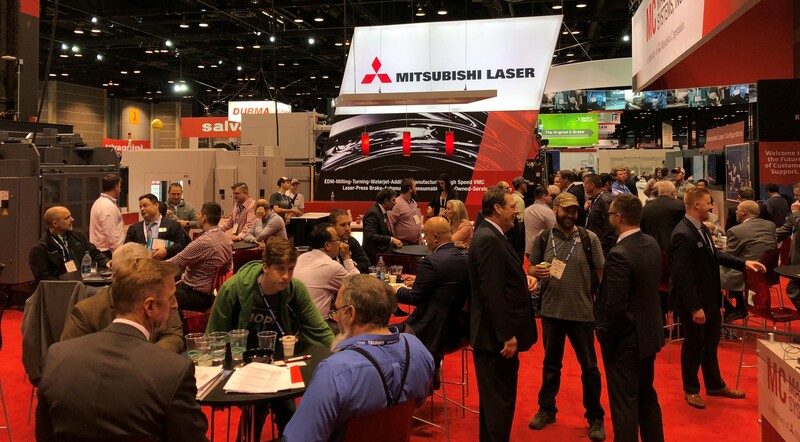 Mitsubishi Laser attended FABTECH 2017 to showcase its newest SR-F 3kW laser, BB4013 electric press brake with automation and remote360 machine monitoring technology. FABTECH is North America’s largest metal forming, welding, fabricating, and finishing event. This year, the event took place at McCormick Place in Chicago, IL from November 6 through November 9 hosting over 50,000 attendees and 1,700 exhibiting companies. Mitsubishi Laser booth visitors had the chance to learn more about the company’s extensive offerings. The newest laser features a 3m by 1.5m footprint with many of the features and options that are popular in the eX-F laser, one of Mitsubishi’s bestselling machines. Additionally, the SR-F laser has Motion Cut, which features the beam on/off time an axial movement simultaneously to eliminate the need for the axes to stop. Another machine highlight at the show was the BB4013 electric press brake with automation. The high-speed ram and high precision repeatability (± 0.001mm) allows the machine to be extremely productive and ensure solid performance. Other press brakes on display included the hybrid BH series, appealing to operations requiring lightning-fast speed and high precision parts.